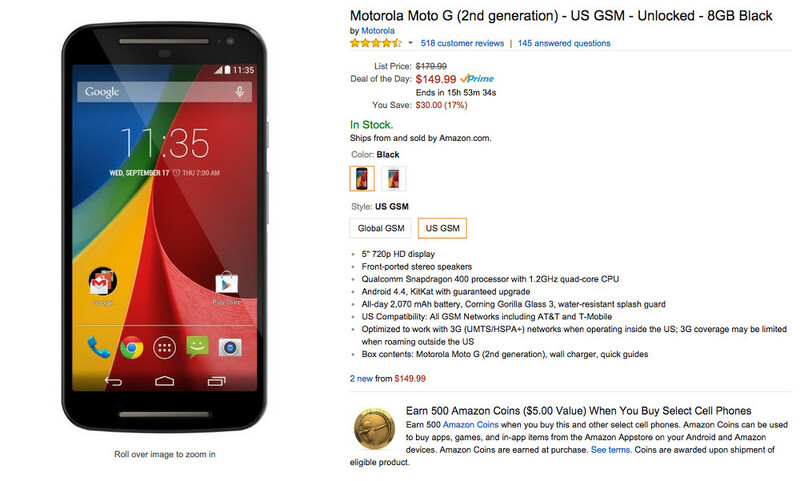 Motorola’s new Moto G (2nd gen) can be had on Amazon today for the ridiculously low price of $149 ($30 off). Keep in mind that that price is without a contract, so the best deal in smartphones somehow just got better than ever. As a recap, the new Moto G sports a 5-inch HD display, stereo speakers, Snapdragon 400 processor (quad-core), 2,070mAh battery, 8MP rear camera, 1GB RAM, microSD slot with support up to 32GB cards, and has already received the update to Android 5.0 Lollipop. It doesn’t have an LTE chip, so you are stuck on US GSM networks, but you should still see pretty decent data speeds. While this phone won’t satisfy the flagship-needy, this is a great phone for anyone not interested in signing a contract with a carrier, kids, or someone who wants an extremely affordable phone without any fuss.